Introduction: This article analyses the different transmedia strategies that European television archives can potentially use to showcase and promote their collections. Methods: The study is based on the case study of four European television archives that follow different models of conservation and access: The British Broadcasting Corporation Archives (BBC, United Kingdom), the Institut National de l’audiovisuel (France), the Netherlands Institute for Sound and Vision (Netherlands) and the RTVE Archive (Spain). Information was collected from the websites and Twitter accounts of these archives and subsequently analysed using three evaluation categories: Expanded Access, Repackaged Content and Ancillary Content. Results: It was concluded that the most frequent strategies were those related to expanded access, particularly with a contextual purpose: commemorations, anniversaries and to illustrate recent events with images from the past. Discussion: Many transmedia strategies are not being implemented by some of the selected television archives. Conclusions: Unlike other cultural heritage institutions that use transmedia strategies to showcase their collections, television archives are in a premature stage in relation to the reuse of this kind of content. Transmedia strategies; TV audiovisual archives; British Broadcasting Corporation Archives (BBC); Institut National de l’audiovisuel (INA); Netherlands Institute for Sound and Vision; RTVE Archive. 1. Introduction and state of the art. 1.1. Transversality of community programmes aimed at strengthening the multimedia content industry. 1.2. European television archives: conservation and access models. 1.3. Transmedia culture in the context of audiovisual archives. 2. Methods and materials. 3. Results. 3.1. Expanded Access. 3.2. Repackaged Content. 3.3. Ancillary Content. 4. Conclusions. 5. References. This article is motivated by the need to showcase the value of the audiovisual archives of public television channels in today’s society. Digital media and, in particular, social media are established as the main assets in this task. In particular, the analysis focuses on the transmedia strategies that are visible on the archives’ websites and Twitter accounts. To develop this project, we selected archives that are representative of the different models of conservation and access of four countries: the British Broadcasting Corporation Archives (BBC, United Kingdom), the Institut National de l’audiovisuel (France), the Netherlands Institute for Sound and Vision (Netherlands)and the RTVE Archive (Spain). This study requires a state of the art review and a suitable prospective of the situation of audiovisual archives in the cross-platform digital age. These audiovisual assets are no longer exclusively dedicated to support internal users and researchers and, thus, their value must be oriented to the exploitation and promotion of their collections. Therefore, it is important to carry out this recycling process through transmedia narratives as a mechanism for the proliferation of new universes of content. This universe is defined by Scolari as “a kind of narrative in which the story unfolds across multiple media and communication platforms, and in which consumers take an active role in this process of expansion (2013, p.46). For their part, Jenkins et. al. (2006:46) define these narratives as those that are “told through different media platforms”, while Costa and Piñeiro (2015) consider that the development of the Internet and the participatory web are the ideal framework for the application of transmedia narratives. Archives, like the rest of heritage institutions, cannot be excluded from this phenomenon that takes place in social media. This multiplicity of media and their participatory character offer a great possibility to these institutions because, once they are digitised, they can add value to their collections through their reuse in other contexts. It is considered, therefore, that this perspective is suitable to carry out this study, because television corporations face the challenge of showcasing their archives. Through this type of strategy, they may act as an element of innovation in the generation of content, for several purposes: nurturing their own programmes, illustrating programmes with past historical or recent events and providing support to expand the transmedia universes that are generated around fiction programmes. -Heritage value: Being archives, they have a double spectrum of users: the medium’s internal users and employees and external researchers. This value is not only contained in full already-broadcast products but also in gross products, and all recorded materials that may have future value. In this environment, digital preservation becomes essential. Heritage value in the web environment changes and acquires its reason for being in the broadcasting policies and the public’s use dynamics. -Exploitation value: It is associated with their utility. Archival material is the natural environment for journalists’ preparation and obtaining of information. However, this material can be reused. This reuse can be internal, to nourish content, but also commercial, to obtain an economic profit. Moreover, this article adds the social value linked to the digitisation of archives and use through digital media, especially in those that privilege collective participation. This value provides audiovisual footage with the ability to nurture social content that is likely to go viral such as news and entertainment content. It can manifest itself also as the core of social media strategies and policies, in which video acquires a relevant role. Moreover, this social value has a public function since it influences citizens. Public television contents deserve to be shown and disseminated to the general public and, therefore, broadcasters have to come up with new strategies to renew their value. This social strategy is also added to the new consumption of television and content, which favours this reuse. Television and content consumption patterns have changed, so the distribution of audiovisual archives has to change too. In this sense, León-Moreno, Zapico-Alonso and Caldera-Serrano (2016) point out the investments of companies in web dissemination and reception through mobile devices. Rodríguez Mateos and Hernández Pérez (2015) add two key phenomena in this new trend of contents: the social audience and the convergence of television with other platforms such as social media. These statements can be completed with the Digital News Report of The Reuters Institute for the Study of Journalism (2017), for which the key elements are the increase of social networks as sources of news, and the consumption of content on mobile phones and tablets (47%), above computers (46%). According to this study, consumption in traditional offline media has decreased, standing at 59% of internet users. This report also highlights the weight of social networks as a source of information (28% of respondents between 18 and 24 said they were their primary source of news) and the role of video in this transmission (29% of people under 45 uses this format to consume information). As we can see, video and social media acquire an essential role for the transmission of content to new generations and this idea connects with the idea developed in this article. For the theoretical formulation of the strategies proposed in this work for audiovisual collections, it is important to know the policies that govern the European audiovisual media in relation to archives, and whether these are oriented, at least partially, to the broadcasting of audiovisual heritage in a multi-platform and participatory environment. Since the beginning of this century we witnessed the strengthening of community actions for the development of the information society envisioned in the guidelines established by the eEurope action plans (2002-2005), the i2010, Europe 2020 and its Digital Agenda for Europe (2010-2020), as one of the key pillars. Since its inception, these actions have aimed to turn the recommendations included in the action plans into community programmes and initiatives for the development of cultural heritage, digital content, the multimedia industry, research and development (R&D), education, Internet security and e-Government (Caridad-Sebastián, Morales-García and García-López, 2011: 440). Making a historical retrospective, one of the most important aspects of the strategy of the EU concerning the information society began to be developed in the mid-1980s, with programmes that aimed to implement the multimedia contents industry: IMPACT 1 and 2. IMPACT 2 was followed by INFO2000 (1996-1999), which complemented and reinforced other community activities aimed at fostering the nascent multimedia content industry in Europe. a) eTen (2000-2006). This was an essential instrument of the eEurope 2005 action plan. It aimed to encourage the development of electronic services, applications and content, and to speed up the deployment of secure broadband Internet access. According to CORDIS (2006), one of the projects that proved to be a success is MICHAEL, which developed an electronic system to access, manage, and update the digital records of 13 national collections, including objects of museums, archaeological and tourist sites, music and audiovisual archives, biographical material, documents and manuscripts. b) eContent (2001-2005). Its predecessors were INFO 2000 and MLIS. It aimed to promote the development of digital content and linguistic diversity in the information society, through multiple channels, including the rapid growth of new services and platforms, such as mobile Internet. For its part, eContent Plus (2005-2008), the successor of eContent, constituted the community multiannual programme which increased the possibilities of access, use and exploitation of digital content in Europe. One of the projects of greatest interest in this area turned out to be the European Digital Library Network (EDLnet), which was launched in 2008 and started the emblematic project Europeana, an access point to cultural and audiovisual heritage collections. c) Culture (2007-2013). It derived from the Culture Programme (2000-2006) and was intended to finance projects and initiatives to protect Europe’s cultural diversity and enhance their cultural heritage, by promoting and encouraging the creation of cultural networks in Europe. d) MEDIA. Constituted the second mode of action of the European audiovisual policy, after the ‘Television without frontiers’ directive, whose basic principles were the free circulation of European television programmes in the domestic market and the obligation of television stations to devote, whenever possible, more than half of their airtime to European works (EUR-LEX, 2008). The MEDIA programme included measures to support the European film and television industry to make it more competitive and able to meet the needs of broadcasters. With the MEDIA programme (2007-2013), the Commission wanted to follow up the measures taken in previous programmes: MEDIA I, MEDIA II, MEDIA Plus, MEDIA Training and MEDIA MUNDUS, which have favoured the development of the European audiovisual industry since 1991. Culture sub-programme: with 31% of the budget, it will provide support to, at least, 8,000 cultural organisations and 300,000 artists and cultural professionals to acquire new competencies. Cross-sectoral chapter: con 13% of the total budget, it will establish a guarantee instrument for the cultural and creative industries. MEDIA sub-programme: with a 56% of the total budget, it will promote the development and distribution of more than 1,000 European films, through traditional and digital platforms; will provide funding to help audiovisual professionals to get access to international markets and will promote the production of films and other audiovisual content. According to the European Commission (2016), since the launch of the MEDIA programme, in 1991, more than 2,400 million euros have been invested in European cultural diversity and creativity. This programme has supported to some 2,000 European productions (movies, TV series and other projects), whose distribution is carried out through digital media, movie theatres, television and video-on-demand services. MEDIA has contributed to the training of more than 20,000 producers, directors and screenwriters to adapt to new technologies. The European Commission (2016) also states that 40 films funded by MEDIA won the Palme d’Or, the Grand Prix or the Award for best director and received a total of 20 million euros in aid. On the other hand, in 2016, 10 of the 21 films in the Cannes’ official selection received financial support from the MEDIA programme. The website of the Creative Europe MEDIA programme, in the section “Facts and figures”, mentions that in the 2014-2020 period more than 800 million euros will be allocated to support the competitiveness and diversity of the industry, through a series of actions: training of audiovisual professionals; support for the distribution of non-national films; support to gain access to markets; support for film festivals showing European content; funding for international co-production; support for online distribution; support to the development of television series and drama; support to the development of video games; support to the development of films; support for cinema networks; and support for audience development projects. At the same time, the most significant advance in community science policies occurred in the 1980’s: the implementation of the framework programmes for research and technological development. The 4th framework programme launched the AVIR project, which is based on new algorithms and aims to develop innovative descriptors for television programmes, based on basic removable information, audio, video or both. These descriptors allow for the analysis and indexing of audiovisual content. This project has already offered features to navigate between frames, search news, retrieve information based on similarity and many other functions (Cordis, 2005). For the 7th Framework Programme (2007-2013), the European Commission implemented different projects that remain in force in some cases or have been replaced by similar projects. The framework programme 7 (FP7) stimulates the reciprocity between the industries of the multimedia sector, cultural institutions and universities within a framework of partnership. An example of this is found in such projects as EUROTRANSMEDIA, Notube and EUscreen. EUROTRANSMEDIA, which covers from 2013 to 2016, brings about a paradigm shift that involves the convergence of all media, both traditional and digital. According to Cordis (2017), the team behind this project has highlighted the need to develop interactive contents and reach their undisputed acceptance by users. In addition, this project recommended the EU to leave behind the old model of local content protection to encourage the creation of artistic universes free from cultural barriers. EUROTRANSMEDIA is formed by the consortium formed by TWIST-Cinema & Digital Media Cluster in Wallonia (the main business organisation in the field of digital technologies for the manipulation of images, sound and text in Belgium), the Swedish Media Evolution (with more than 400 members), EureCat-Centre Tecnologic Catalunya (a non-profit private organisation whose board integrates representatives of research institutions, universities, public administration and companies), Cap Digital (with 800 members, of whom 80% are SME and startups, including the most active in the French digital industry), Le Pôle Media Grand Paris (an non-profit organisation with more than 100 members of companies, public authorities, scholars and researchers, covering all the activities of the digital media industry: cinema, television, transmedia, CGI animation, digital archive, among others), Plaine Commune of France (which houses fifteen data centres, sixty-five cinema, television and audiovisual studios), Public Service of Wallonia-SPW (regional administration in charge of the general management in the Region of Wallonia), INTERFACEUROPE and Estonian Digital Centre. For its part, the NoTube project (2009-2012) brought together entities dedicated to the creation and dissemination of digital content (such as the British Broadcasting Corporation, one of the objects of study) and experts in platform integration. Its purpose was to link different media: web and television (Web+TV), so that consumers can watch programmes and interact with their contacts, regardless of the device used. Dan Brickley, one of the coordinators of the project, said that Web+TV prototypes that benefit viewers the most will be those using open standards. A report funded by the FP7-ICT stated that the project led by the BBC R&D (the research department of this corporation), developed methods to generate recommendations on programmes, on the basis of social activity, and created technologies that made it easier for the viewer to comment of share television-related information on their networks, without violating their privacy (Cordis, 2012). A product of this project (2009-2012) is the EUscreen, which is based on the experience of a network of audiovisual archives, scholars and technical partners. It established a consortium, with 31 organisations (including two of the TV archives under analysis: INA of France and the Netherlands Institute for Sound and Vision). Broadcasters and archives from all over Europe have contributed a significant number of videos and their own programmes, with professional audiovisual content. The EUscreen website offers free online access to thousands of contents that represent the audiovisual heritage. This website provides an insight into the social, cultural, political and economic events that took place in the 20th and 21st centuries, narrates important historical events and allows users to explore TV shows that focus on everyday experience. On the other hand, the EUscreen project set virtual exhibitions were to contextualise the items in the collection. Its successor, the EUscreen XL, started in 2013 and lasted until 2016, under the framework programme 7. Its website announced the expectations of this latest project: “The Core Collection [EUscreen platform] will consist of 60,000 items of high quality, enriched and curated content and metadata made available through the EUscreen platform and Europeana. 20,000 items of content drawing on content from television series around Europe or from distinct film and video archives collections will be added to the exiting content of 40,000 items (selected by historical topic or for specific exhibitions)”. Moreover, although Europeana was a project that resulted from the eContentplus programme (2005-2008), under the name of European Digital Library Network (EDLnet), it currently also receives funding of R&D programmes, in particular of the Framework Programme 7. This project has become is a single access point to more than 51,132,068 digital archive resources (December 2017) ranging from prehistory to the present day, specialised in art, fashion, music, photography and the First World War. They contain galleries, blogs and exhibitions provided by 2,200 European institutions, including also three of the analysed TV archives: the BBC (United Kingdom); the Netherlands Institute for Sound and Vision (NISV)and the French Institut National de l’Audiovisuel (INA) (Table 1). Finally, the goal of the Europe 2020 strategy includes, in the present period, an investment of 3% of the GDP in R&D. Among the measures proposed to achieve this goal, the European Commission presented the latest R&D programme, Horizon 2020 (2014-2020), with 80 billion euros. According to data collected by CORDIS (2017), one of the projects implemented is SENTAB, funded by Horizon, which connects elders with other citizens, combining smartphones, tablets y PCs con television sets to make easy-to-use video phone calls, cognitive games, community interaction, free content, news and social networks. Having reviewed the major European strategies and to contextualise the study, the following section will outline the different models of conservation and access of the audiovisual archives of the selected corporations. Television archives are part of the audiovisual and cultural heritage of a nation. Their consideration as cultural heritage is guaranteed by international organisations with competence in such matters like UNESCO, which in 1980 at the 21st meeting of the General Conference recommended to “safeguard and preserve moving images” (UNESCO, 1980), including “television programmes produced by or for broadcasting corporations”. The recommendation includes legal and administrative guidelines for officially-recognised archive institutions to get access, for their safeguarding and preservation, to a part or the totality of their country’s domestic production, like “the creation of legal deposit systems”. Nevertheless, it insists that these measures should respect national and international legislation on sensitive subjects such as “copyright protection”. Coinciding with the commemoration of the 25th anniversary of the adoption of this recommendation, and as a measure to raise awareness of the need to preserve this heritage, UNESCO proclaimed 27 October as the World Day for Audiovisual Heritage (UNESCO, 2005). Likewise, professional bodies like as the International Federation of Television archives (IFTA) have, since their creation in 1977, made recommendations in this regard. In 2004, within the framework of its annual Conference, the Federation presented the so-called “Paris calling”, which urged leaders to take measures for the safeguarding of radio and television archives (Hidalgo, 2014: 11). However, despite this recognition, most countries lack legislation in this regard. In his numerous studies on TV archives, Hidalgo (2013, 2014, 2017) underlines that the lack of policies for conservation, preservation and access to documents in the archives is the rule. With regards to conservation and access structures there is no single model. For the European TV archives, the author points out different realities arising from the presence or absence of a legal framework to govern their management and their greater or lesser protection. The different situations include countries in which TV audiovisual documents are subject to a legal deposit law and whose legal responsibility depends on public bodies, sometimes created for this purpose, such as France, which created the INA to manage the archives of all public and private broadcasters, and Norway, whose management depends on its national library. Most countries, however, do not have an official body for this purpose nor have a binding legal deposit law for audiovisual documents. Thus, in these countries, TV companies and organisations themselves are responsible for the management and conservation their own archives and this is done according to their own commercial and business criteria (Hidalgo, 2013: 149). With regards to our study, the audiovisual archives of the analysed corporations (BBC, INA, NISV and RTVE) respond to different conservation structures so they exemplify in a paradigmatic way the different management models of television audiovisual heritage. Television programmes in the United Kingdom are not subject to a legal standard of legal deposit. The management of TV archives is shared by the BBC and the NFA (National Film Archive) (Pérez, 2011: 170). This institution, created in 1935, is part of the British Film Institute (BFI), which is responsible for the preservation and access of both motion pictures and television programmes. Its archive preserves the material of the BBC since 1950. 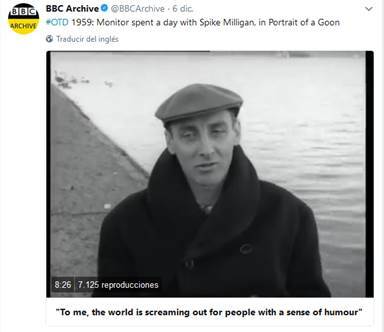 For its part, the BBC archives part of its production corresponding to the first broadcasts and the period after World War II (Hanford, 1986). The website of the BBC archive is open in some thematic radio and television collection, documents and photographs since the 1930s, although the own website warns that it is no longer updated. France is one of the countries that has been gradually adopting a real conservation policy and where the heritage value of audiovisual archives is recognised since the earliest times. Since its inception in 1975, the INA is the public body responsible to ensure the conservation and preservation of the radio and television archives. In 1992, the INA was entrusted with the control of the legal deposit of documents of all public and private radio and television networks. The Inathèque de France was created in 1995 for its management, establishing the first consultation Center at the National Library of France in 1998. Also, since 2006 it is responsible, together with the BnF, for the legal deposit of French media companies’ websites. From its inception, the INA was configured as a public institution of a patrimonial nature, but it is also an industrial and commercial entity responsible for the exploitation of the archives of all the public and private broadcasters that have signed agreements with the Institute. The actions planned by INA for the 2015-2019 period include the need to rethink the role of audiovisual archives in the digital age and in the context of social networks. Netherlands is another country which has a public institution for the preservation and conservation of the national audiovisual heritage. The configuration of a national body with responsibility in this area began to take shape in the mid-1990s. In 1997, the government creates the Dutch Audiovisual Archive that merges the audiovisual archives of the Dutch public radio and television, the RVD (Netherlands Information Service), the Dutch Film and Science Foundation and the Broadcasting Museum in the Netherlands. Since 2006, already named NISV, this institute adds to its heritage mission the museum function, becoming an institution for media culture that focuses on collecting and preserving most of the audiovisual heritage of the Netherlands and making it available to the largest possible number of users. Currently, it has a multimedia library with audiovisual, print media, websites and objects related to the different media. Its website provides free access to a selection of materials for educational purposes, although the institution has declared that it will open the entire audiovisual collection in 2019. The value of the Spanish audiovisual heritage is recognised in different laws and regulations, however, the responsibility and procedures to safeguarding remain vague. Precisely, “audiovisual programmes broadcast by audiovisual communication services” are “excluded from legal deposit” in the last Legal Deposit Law of 29 July 2011 (Hidalgo, 2014: 22). Spain is, therefore, one of the countries in which the preservation and conservation of television audiovisual heritage is the responsibility of the television networks themselves. 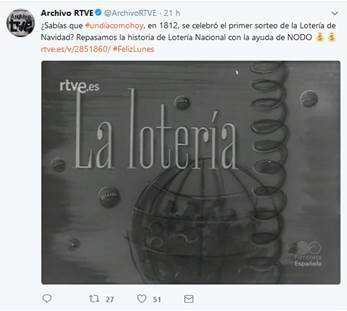 In the case of the national public television, the RTVE corporation is responsible for the conservation of its audiovisual archives (Hidalgo, 2013: 148). In 2008, RTVE launched through its website, the RTVE Archive, which provides open and free access to its audiovisual heritage (Bazan, 2014: 12). In this sense, the policy of the Spanish public television would be a good practice of how these archives can be re-valued and known (Hidalgo, 2013:162). As noted in the introduction, the experience and the consumption of content, either fiction or reality, has radically changed due to new elements such as the interaction with the audience, different measurement tools, and multi-platform consumption. To understand this proposal of transmedia strategies to broadcast audiovisual archive materials, it is necessary to know how to deal with these new perspectives in the scientific literature. As Quintás and González (2014) point out, the concept of “Social TV” derives from the combination of social networking, second screens and television. Scolari has called it “hyper-television” (2008), while others call it, due to its capacity to adapt, as “TV morphosis” (Orozco, 2012). Despite these changes, for Hagedoorn and Agterberg (2016), television is playing an essential role in the recovery of archived documents that can be distributed across new online platforms. This reuse of film stock from audiovisual archives in new platforms connects users with the past and serves as a context to obtain transmedia and crossmedia products (Hagedoorn, 2016:168). In this context, audiovisual archives can be configured as new communication channels, rewritten in a scenario where the power of interaction between the transmitter and receiver is unpredictable, as Jenkins (2006) points out. In these innovative contexts, contents are designed to be transmedia, i.e., to be reused across multiple platforms. These new digital narratives based on storytelling are an opportunity for the reuse of archive footage. Since the late 1990s, digital technology has fostered the creation of stories more quickly, especially through new forms of social software that have opened up the stories to amateurs (Hancox, 2017). In this sense, digital storytelling emerges as part of a wider paradigm shift in communication, where the traditional hierarchy evolves towards a communicative peer-to peer environment (Hartley, 2009). In the transmedia narrative, in particular, each new text is developed across various media and makes a specific and valuable contribution to the whole story (Jenkins, 2008). In this environment, the viewer is expected to play an active role in consumption, like a collector or a hunter in search of those fragments of content, so participation and more active entertainment are encouraged (Jenkins, 2008). For this reason, in addition to the communication strategy, this environment strengthens engagement with content. The emotional dimension of these strategies becomes decisive for making them more effective (Sánchez Castillo and Galán, 2016). The archive can be another partner that collaborates in the expansion of these universes by promoting the emotional bond with viewers. To do so, it is necessary to break the traditional view of television archive images. In this sense, Hagedoorn and Agterberg (2016) reclaim the role of the archives of the national television corporations as essential agents in contemporary historical knowledge. To this end, they appreciate the potential impact of its online distribution capacity, its contextualisation and, of course, its digital preservation. Under the terms of this article, the contextualisation is certainly a key element. Dekker (2014) values in these strategies their uniqueness and originality, without the mere duplication of archive contents. This author considers that distribution despite being multiplatform is still conventional and sees an opportunity in the new transmedia concepts for dissemination. Caldera Serrano and León Moreno (2016) make another step in this type of strategy when they recognise the possibility of playing with augmented reality technologies to exploit archive collections. These authors defend the use of mobile devices to access images used in the creation of a programme, mixed with additional elements that arouse interest in users. With the help of this type of new technology, a new multimedia product can be developed to act as a conceptual audiovisual content map of an event or programme, based on archival documents. Hagedoorn and Agterberg (2016) recognise the role of broadcasters and archives on the development of new types of engagement in users, including more open explicitly on-demand content, favouring new experiences with the television content. They point out that, in the Dutch case, this tendency has coincided with an increase in historical productions and documentaries, which have implemented new forms of crossmedia and storytelling that re-used footage in different ways. Hagedoorn, in 2015, provided the example of the series In Europe, a TV projectbased on a multi-platform storytelling strategy. The author also emphasised the work of these mechanisms in the creation of more effective collective memories. In this sense, the same happens in Spain in the case of fiction programmes, in particular, with the intersection of fictional series with archival documents that act as contextualising elements. The most paradigmatic example of collaboration and the development of an expanded universe has not been carried out by an audiovisual archive, but by heritage institutions, such as the National Library or the National Archives of fictional series like El ministerio del tiempo, where these institutions act not only as an expanded universe of the series, but also carry out a curating process of their own collections to disseminate them and renew their value across social media (Martínez Cardama, 2017). Both broadcasters and their archives are adapting to the new types of audience participation, based on the re-contextualisation of the contents and their opportunities. At the professional level, it is necessary to highlight the Dutch example of the development of the AVResearcher XL tool, where we can appreciate a work method in which content goes beyond of what is broadcast (Figure 1). It is a meta search engine for researchers which can locate metadata both issued content traditional catalogues, programmes and content, as well as that associated with them on the social network Twitter. This example shows how to professionally as cross-platform and cross-media perspectives are understood to interact and study contents. It includes various digital preservation policies, including the archiving of the web to all digital documentation associated with audiovisual production processes (Hagedoorn and Agterberg, 2016). From the view of the creation of collective memory and the social perspective, audiovisual archives can be a key element for social media policies and can make use of these dynamic storytelling options. The challenge of audiovisual archives has been well analysed by Rodríguez and Hernández (2015), who focused on three key concepts in television 2.0, which appears in the work of Askwith (2007): expanded access, repackaged content and ancillary content. With regards to the first,expanded access refers to access to contents where there is no original reworking. Rodríguez and Hernández (2015) point out that audiovisual documentary-makers must revitalise content, relating it to the present or other series and programmes. Ancillary content refers to the development of new content based on the pre-existing one. Finally, repackaged content is the result of the dissemination format: the creation of universes (biographies, historical summaries of the time depicted in the fictional series, etc.). In any of these three categories, the role of the documentary-maker may be crucial for the analysis of the textual content that is generated, before, during and after every television consumption (Rodríguez and Hernández, 2015). These authors suggest tracking hashtags to follow content and metadata to proceed to their segmentation. This connects with the future challenges of the profession: measuring social audiences and the participation of archive documents in this process. The main objective of this study is to know the current role of archive audiovisual materials in the creation of transmedia strategies. In this case, taking into account the role of social audiences, we have focused mainly on Twitter. At the same time, the study aims to know the different ways in which public broadcasters raise awareness and renew the value of their audiovisual heritage among the new generations across new digital media. Therefore, the study includes the analysis of the Twitter accounts of four paradigmatic public television corporations: RTVE of Spain, BBC of the United Kingdom, INA of France and NISV of the Netherlands. This selection aims to provide an overview of different models of conservation and access of audiovisual heritage: ranging from a very protectionist perspective, where images are subject to legal deposit laws of the country and public bodies have been created to curate them, such as the French INA or the Dutch NISV, to less protective models in which production and broadcasting companies themselves are responsible for preserving and disseminating this heritage, as it is the case of RTVE in Spain, and including a third model, like such as English one, in which management is shared between broadcasters’ audiovisual archives and the British Film Institute (BFI), which is responsible for access. * The second link corresponds to the professional service that manages the sale of images online. Given that the professional literature does not address specific evaluation indicators to analyse the transmedia strategies of audiovisual archives, we identified our own areas of assessment. The development of these categories took into account the trends that have been identified in recent studies on the sector, such as those carried out by Hagedoom (2015), who uses the storytelling for the revaluation of archive audiovisual documents to create a collective participatory memory. This trend was also identified in 2016 in Hagedoorn and Agterberg, who discussed the end of conventional television archive and predicted a future marked by the dissemination of content under crossmedia strategies. Other more general studies that evaluated the websites of TV archives (Antón and Guallar, 2014) have been discarded as well as the study of Codina, Aubia and Sánchez (2008) which provides indicators to analyse only the websites of these corporations. The work of Rodríguez and Hernández (2015), despite being centred on the case study of a fiction series (El Ministerio del Tiempo of RTVE), has also been taken into account to group together the areas of evaluation since it is a relevant work on the possible applications of transmediality to archived audiovisual documents. These authors focus on the promotion of audiovisual archives based on the categories established by Askwith (2007): expanded access, repacked content and ancillary content. The following areas of evaluation have been established based on these proposals. 1. Expanded access: content is revalued as it was originally produced. 1.1. Dissemination of already-broadcast programmes that is available on the archive’s website. 1.2. Contextual purpose: use of footage to illustrate a current reality. It has three uses: commemorations, anniversaries and contextualisation of past events or related news. 1.3 Customer loyalty strategies through Twitter. Use of hashtags to build customer loyalty in new users (i.e. #happymonday). 2. Repacked content: development of new content based on the reuse of the original productions. 2.1. Support for new programmes based on archival documents. 3. Ancillary content: new content derived from a production. 3.1. Creation of transmedia narratives through: websites of characters and plots, making of, virtual reality, purpose-created historical content to expand the plot. The analysis of the results has been performed from a qualitative perspective. Based on the aforementioned evaluation areas (table 3), the results have been grouped for the four institutions under study: BBC, INA, NISV and RTVE. Although the website of the digitised archive of the BBC offers collections and selections of digitised programmes, it informs that its contents are no longer updated, but are still visible in other online platforms: such as the BBC website (BBC Player), its professional image sale service, the current BBC Motion Gallery, hosted at Getty Images, and their offline collections, previous contact with the centre, in BBC Broadcast Archive. It is important to note that this management is shared with the BFI, which archives the collections of this company since 1950. Its Twitter profile, @BBCArchive, was created in 2009 and has 8,916 posts (December 2017). This archive does not provide access to full programmes that have been already broadcast through the website of the archive. In fact, it does not provide any link to the page of origin, as it is embedded. The French National Audiovisual Institute is the public entity that manages access to the audiovisual archives of the French public and private broadcasters. Its contents are arranged in a website organised by broadcasting dates, thematic categories and personalities. In addition, it has a powerful search engine, which allows users to filter contents by categories and dates. Its Twitter accounts has made 13.3 K posts but does not provide access to full programmes. Like the BBC, it posts embedded video and does not provide external links. However, on several occasions it gives us the possibility of accessing content such as special reports on different topics, such as immigration, which are available on the website or its YouTube channels. This important Institute, which archives 70% of the audiovisual production of the Netherlands, is one of the most important audiovisual archives in Europeana. As we have pointed out, it has a triple dimension: it is the central archive of Dutch television, it is a cultural and heritage institute and a museum. Despite this, its Twitterprofile (@BeeldenGeluid), which was created in 2009 and has 9.733 posts, is not used to renew the value of its great heritage. Only in exceptional cases it provides access to contextualised audiovisual documents. In the majority of cases, the tweets refer to the activities and agenda of the institute. The website of the RTVE Archive was launched in 2008 and gives access to all types of digitised content. Of the selected archives, it shows the greater commitment to provide full material without prior payment. Its Twitter account (@ArchivoRTVE), with 10.1 K posts, was created in 2014. However, it is an example of the dissemination of expanded access of original content. Each tweetcontains a link to the website of the archive, where users can watch full already-broadcast programmes. b) Contextual purpose: connection of footage to illustrate a current reality. It has different uses: commemorations, anniversaries and contextualisation of past events o related current events/news. The analysis of the archives indicates that this is the most frequently used strategy in their social accounts. In most cases, archive images are used to illustrate events from the current reality. As in other cases, this hashtag is also used to commemorate births, deaths, and events in the lives of important people (writers, actors, etc.). Unlike the BBC, the French institute uses other contextual strategies. 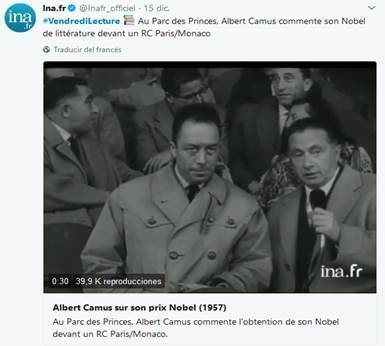 For example, in the case of the ephemeris, INA does not use any on-this-day type of hashtag (#cejour) and instead expresses it directly in the text of the tweet (Figure 3). In addition, it disseminates content already broadcast through its archive to contextualise current events. 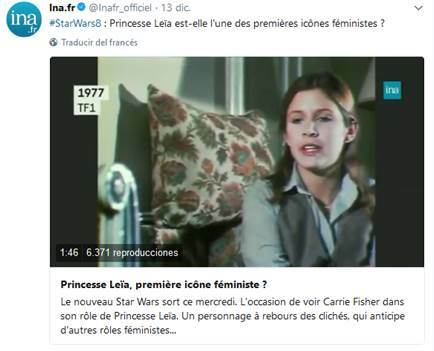 As we can see in the example (Figure 4), INA takes advantage of the launch of the new Star Wars movie (using the hashtag#Starwars8) to show the interview conducted in the past to Carrie Fisher. As mentioned, the policy of dissemination of contents of the Dutch Institute is radically different to those of the other corporations. Most of the content published on its Twitter profile make reference to activities carried out by the Institute and its museum. After doing an exhaustive search, it was found that the contextual approach is very limited. In addition, it does not use on-this-day hashtag (#Opdezedag) to commemorate anniversaries or other events. Television Española, through its archive, is the institution which, in our view, has the best content promotion strategy to publicise its collections with a contextual purpose. It meets the three criteria established in this area of assessment (Figure 5). Figure 5. Strategies to communicate the day’s anniversaries, commemorations and use of past events to contextualise current news. 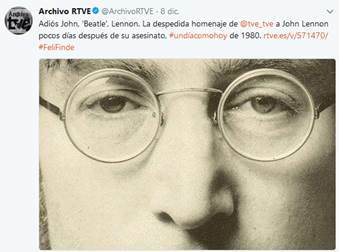 For the day’s anniversaries, RTVE uses, like the BBC, the hashtag#undiacomohoy, which is very common in the social media strategies of heritage institutions, always accompanied by a link to the TV archive, which offers the possibility to watch the full content. This dissemination philosophy is used for commemorations and to remember past events that can illustrate current realities and news (Figure 5). Some institutions also use trending hashtags on Twitter, even if they lack semantic sense, as a means to reach a kind of audience that otherwise would not visit the archive. This practice is common in the contents broadcast by the Twitter account of the RTVE archive (Figure 6). 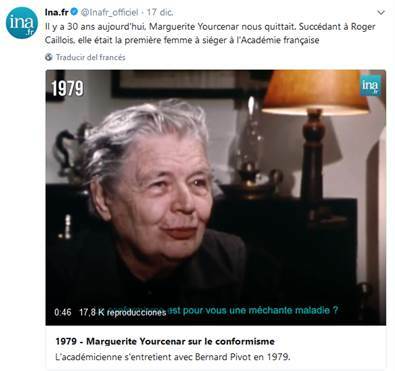 A similar trend to exploit trending hashtags is observed in the French INA. An example is the collaborative hashtag to promote reading #vendredilecture, which is oriented to disseminate archive documents related to books and writers (Figure 7). This section discusses whether the different Twitter accounts of the archives provide information on current productions that reuse archive footage. The comparison of this and the previous strategy indicates that it is not a common practice. A detailed analysis of the four institutions has enabled us to find this tendency in the INA and RTVE. With regards to the INA, its Twitter profile provides access to new products that include archive documents. It is worth noting that this account never offers the full content in open due to its marketing policy. 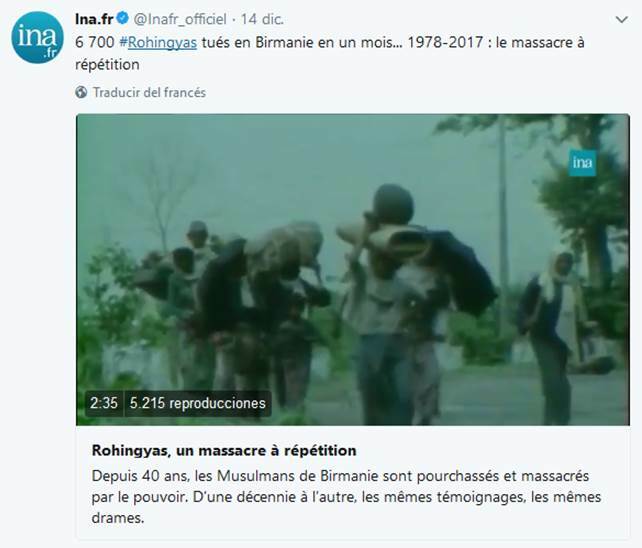 An example of this case is the product about the current crisis of the Rohingya in Burma which mixes images from different French television channels from 1978 to 2017 (Figure 8). The Spanish case is once again the most prominent. In recent years, the economic crisis has led to the proliferation of programmes that are made mainly of images from the RTVE archive. The most paradigmatic case is the programme Cachitos de Hierro y Cromo. 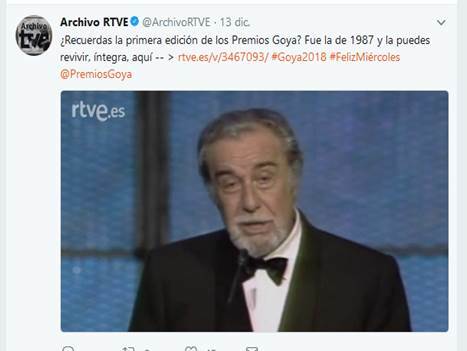 The Twitter account of the RTVE archive takes advantage of its broadcast during the week and, through timely hashtags, remembers key moments of their broadcast (Figure 9). a) Creation of transmedia narratives through: pages of characters or plots, making of, virtual reality, purpose-created historical content to expand the plot, etc. With regards to the transmedia narratives understood as repackaged content, there is a striking absence of strategies, when it could be a mechanism with great potential for television channels to showcase their collections more effectively, especially among the youngest audience. Its use in fictional series, for example, could be a very attractive setting to showcase their archives like other heritage institutions such as the National Library of Spain and the National Historical Archives have done it, with series such as Ministerio del Tiempo, Isabel o Carlos, Emperador. 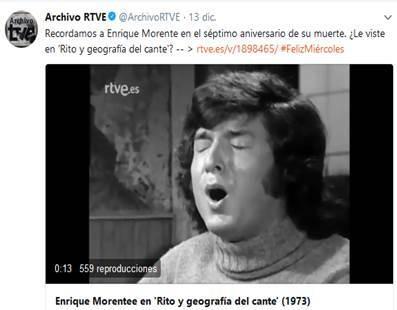 The Twitter account of the RTVE archive does not mention or include expansions to these stories, which does occur on the platforms that broadcast such series and in other heritage institutions. Narratives of this kind are used somehow in the selection of materials that the INA and the NISV develop and make available through their catalogues, and free of charge, for educational purposes. In most cases, these are audiovisual products, made with materials taken from their own archives which, using repackaged content, provide added value. Thus, documents are accompanied by thematic guides, teaching guides, lessons, presentations and other educational materials. The NISV also has expanded virtual reality projects such as BigArtRide and Media Art, which allows young artists to reuse images from the archive to enrich their artistic creations. The analysis indicates that there is a very limited use of transmedia strategies by the selected archives. Taking into account the heritage value of these archives as a guarantor of the collective memory, audiovisual media professionals should be aware of the importance of the development of such strategies aimed at the exploitation and valorisation of their contents. The four selected institutions represent different structures in terms of models of conservation and dissemination. Except for the Dutch Institute, all of them reuse their material in the category of expanded access. While archival material has always been a source for the creation of new content, its use under transmedia strategies will increase the visibility of their collections and generate greater engagement with users. It is considered that audiovisual archives are losing a golden opportunity to add value to all their collections. As cultural institutions, they offer cultural content, but if this content can be combined with the creation of experiences as part of a strategy that spans across multiple platforms in a transmedia proposal, it will reinforce the social vision of audiovisual archives and will raise awareness about the importance of safeguarding our audiovisual heritage. Caldera-Serrano, J y León-Moreno, J. (2016). Implicaciones de la realidad aumentada en la gestión de la información audiovisual televisiva. Journal of Information Science, vol. 42, no 5, p. 675-680. Dekker, S. (2014). Kamerbrief over toekomst van het publieke mediabestel. Brief van staatssecretaris Dekker (OCW) aan de Tweede Kamer over de toekomst van het publieke mediabestel. Recuperado de https://www.rijksoverheid.nl/documenten/kamerstukken/2014/10/13/kamerbrief-over-toekomst-vanhet-publieke-mediabestel. Hagedoorn, B., y Agterberg, B. (2016). “The End of the Television Archive as We Know It? The National Archive as an Agent of Historical Knowledge in the Convergence Era”. Media and Communication, 4(3). Hancox, D. (2017). “From subject to collaborator: Transmedia storytelling and social research”. Convergence, 23(1), p.49-60. Hanford, A. (1986). Panorama de los archivos audiovisuales. Madrid: RTVE. Hidalgo, P. (2013). “Prevenir la amnesia colectiva: El acceso público a los archivos de televisión”, Documentación de las Ciencias de Información, 36, p. 143-166.DOI: http://dx.doi.org/10.5209/rev_DCIN. 2013.v36.42946. Hidalgo, P. (2014). “El archivo de RTVV Patrimonio Audiovisual de la Humanidad”, Métodos de información: MEI, 5, 8, p.17-30. DOI: http://dx.doi.org/10.5557//IIMEI5-N8-017030. Hidalgo, P. (2017). Preservación del patrimonio audiovisual de televisión. 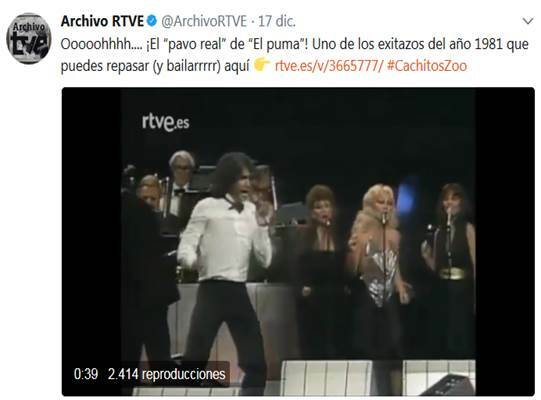 El archivo de Televisión Española (TVE): de los orígenes a la digitalización. Director: Félix del Valle Gastaminza. Tesis doctoral. Universidad Complutense de Madrid. 2015. Orozco, G. (Coord.) (2012). Tvmorfosis: la televisión abierta hacia la sociedad de redes. México, D.F: Tintable. Pérez, B. (2011). Fuentes para la producción audiovisual. En: Documentación Audiovisual. Madrid: Síntesis. ISBN http://dx.doi.org/ 978-84-975674-6-6, p.167-197. Rodríguez-Mateos, D. y Hernández-Pérez, T. (2015). "Televisión social en series de ficción y nuevos roles del documentalista audiovisual: el caso de ‘El Ministerio del Tiempo". Index.Comunicación Revista Científica de Comunicación Aplicada. 5(3). p.95-120. UNESCO. Actas de la Conferencia General, 33ª reunión París, 3-21 de octubre de 2005. Recuperado de: http://unesdoc.unesco.org/images/0014/001428/142825s.pdf. Article received on 28 November 2015. Accepted on 25 April. Published on 4 May 2018.